Butter, that is what I felt on my lips when I first used this Matte liquid lipstick from Dose of Colors Cosmetics. I have been wanting to try this brand, then I finally decided on a shade and ordered. Glad I made that decision. It is an independent brand and produces its own colors so most of the times the products do end up being out of stock as they sell out quickly. Founded in 2013, Dose of Colors (DOC) is the brainchild of Armenian makeup artist Anna Petrosian who aspired to have a brand of her own to experiment with colors. 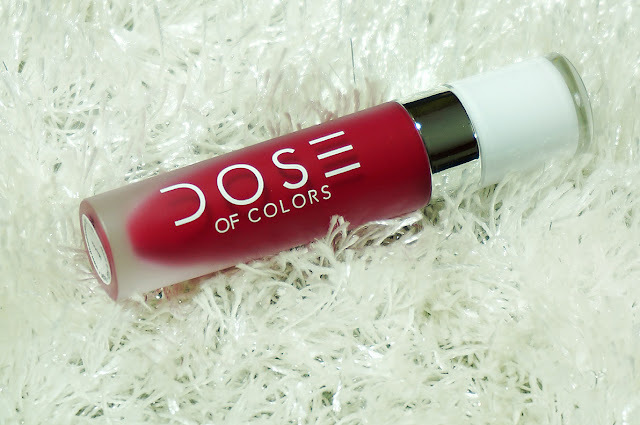 So many Beauty Bloggers and Instagrammers have been raving about Dose of Colors and obviously after holding on to my temptations, like you all know, I have started giving into them more (hides face). No regrets, I bought it so let's own this! The packaging is very presentable. I really like the outer white box with splash of colors through the logotype. The logotype is very creative. 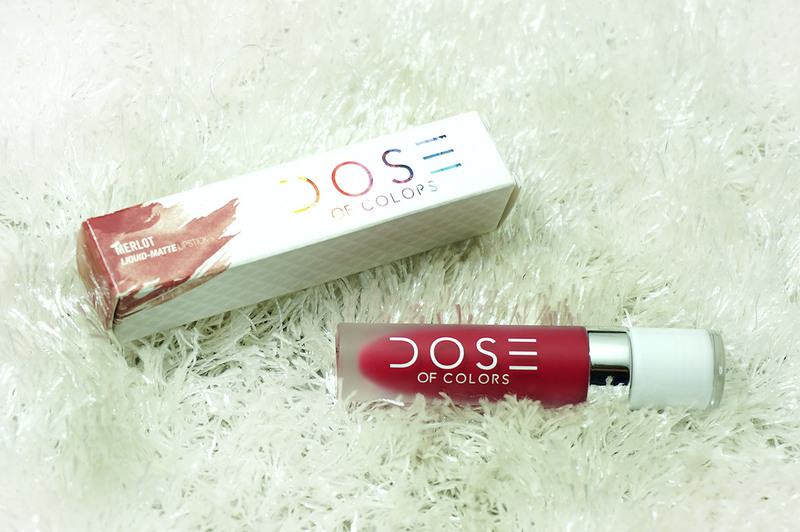 The liquid lipstick tube itself is very pretty. I love the frosted matte plastic tube, very chic. The design is also strudy and the cap clicks to close securely. The doe foot applicator is cushiony and easy to use. 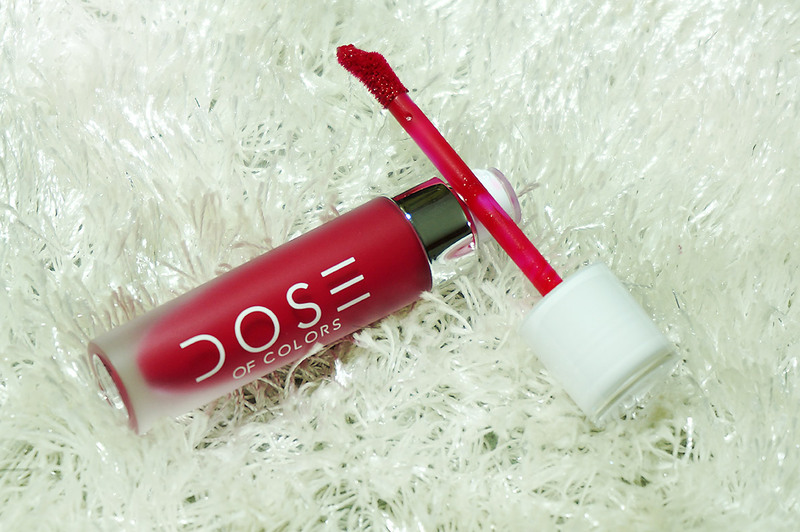 As per brand: "Our liquid lipstick is a velvety high-fashion matte finish which envelops lips in a rich color. Glides on smoothly and stays put throughout the day." The formula is cruelty free (thumbs up), vegan, gluten and paraben free. It is liquidy yet thick and pigmented. 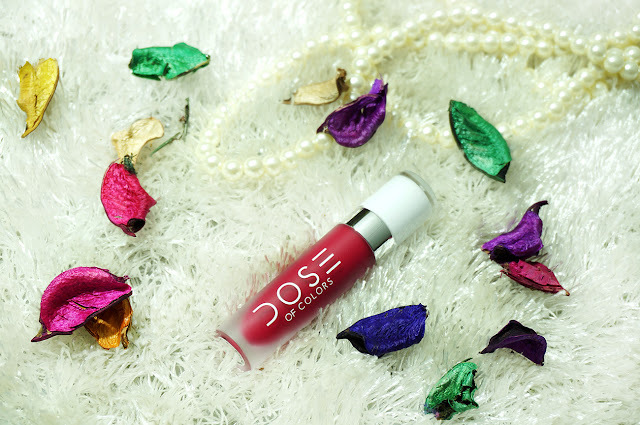 The rich in color formula glides so smoothly and leaves your lips feeling velvety smooth. Even though it has a matte finish it didn't dry my lips though it is ALWAYS recommended to scrub your lips before apply matte liquid lipsticks for better application and look. It didn't bleed either and even though it is liquidy I had no issues with application. It smells sweet but the fragrance is very subtle, not strong. Super pigmented and last long (lasted 6+ hours). It doesn't transfer (maybe a bit with oily food). I found the formula better than Jeffree Star (don't kill me! I love Jeffree too). The shade I got is MERLOT which is a deep reddish pink shade, almost like light red wine. 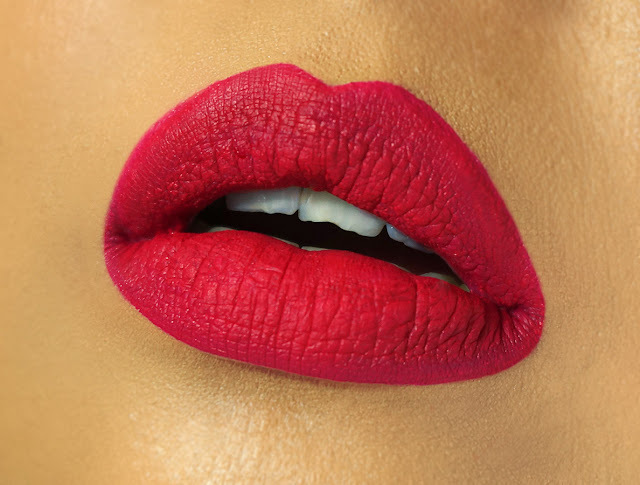 The shades do appear different as per your lip's own natural color. I am in love with Merlot. I am most probably going to go for BRICK next time. Overall a good brand to own for sure and I will buy more (after I save a bit). It retails at $18 on the actual WEBSITE but if you are ordering from Pakistan through a page, like me, it came to around PKR.2400 but it is worth it, promise! I've heard a lot about Merlot. Definitely purchasing this. DoC has the best formulas! I swear man! I am on a makeup ban otherwise their new shades are bomb!